The National Center for Jewish Film is an independent 501(c)3 nonprofit arts organization. Since NCJF's founding, the Center has received numerous grants from the National Endowment for the Arts (initially through the American Film Institute) to assist with the preservation of film materials. The National Endowment for the Humanities was an early supporter, awarding NCJF a Challenge Grant in 1984. At the state level, the Massachusetts Cultural Council has awarded continuous operational support funding for more than thirty years, and in the 1980s (when such grants were available) a number of conservation grants for film preservation. 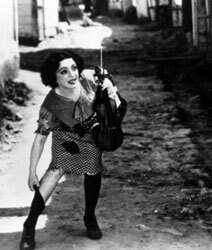 NCJF has received numerous grants from the National Film Preservation Foundation for the preservation of rare, “orphan” films. Eastman Kodak Company has supported NCJF by donating film stock for the Center’s film restorations. The Righteous Persons Foundation and the Conference on Jewish Material Claims Against Germany have been supporters of NCJF. Annual allocations from Combined Jewish Philanthropies contributes to operating funds. Supporters in the film industry and the film archive community have included Sony Pictures Entertainment, Loews Theaters, Orion Pictures, Universal Studios, Louis B. Mayer Foundation, Films Incorporated, Swank Motion Pictures, Northeast Historic Films, Janice Allen & Cinema Arts Inc, John F. Kennedy Presidential Library, United States Holocaust Memorial Museum, and Library of Congress. NCJF has received generous support from many individuals and family foundations, including substantial support from Henry & Edith Everett, Jules & Linda Bernstein, and Arnold & Ruth Picker, Foundation supporters include: The Righteous Persons Foundation, Wellfleet Foundation, Kenneth Kolker Foundation, Koret Foundation, Ronald S. Lauder Foundation, S. H. & Helen R. Scheuer Family Foundation, Joseph & Rae Gann Foundation, Sidney Stern Memorial Trust. Thousands of rare and endangered films with artistic and educational value and exclusively owned by NCJF are in critical need of preservation. Without your help, these rapidly deteriorating moving images will fade into history. Donate funds. Donate films. 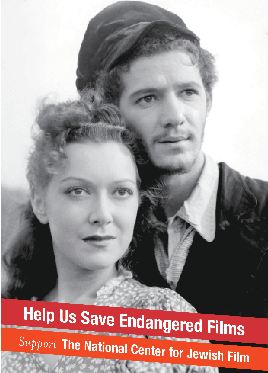 Donate film stills, posters, scripts, and handbills. Contributions to The National Center for Jewish Film are tax-deductible. NCJF relies on earned income to help sustain its unique work. NCJF activities include: licensing film footage rights to new film and theater productions and museum exhibitions; distributing films (more than 250 restored classics and new independent films) for public exhibition at film festivals and non-theatrical venues and for DVD sale to institutions and individuals; acting as a non-profit parent organization (fiscal sponsor) for new films in production. These activities also further NCJF’s mission, which includes making available to the widest possible audience films documenting the vibrancy and diversity of Jewish life. Since its establishment in 1976, NCJF has been located on the campus of Brandeis University. Invited onto the campus by Brandeis President Marver Bernstein, NCJF has received in-kind support and encouragement from the University. NCJF collaborates closely with the University, its numerous departments, centers and institutes.